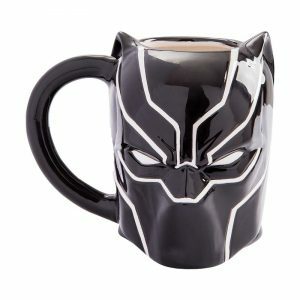 Try the first sip of Wakandan Coffee in a Black Panther Mug! Wait. You have tried it, right? Wakanda is pretty much the tech capital of the comic world, and if you already thought Aztec beans are top notch, well, just wait until you try some coffee made from plants grown in vibranium infused soil! Naturally, the best way to enjoy coffee would be in a very special mug. And how about one that mimics the King of Wakanda himself? T’Challa, of course, the Black Panther from the legends! This Black Panther Mug is a premium sculpted ceramic mug – the perfect way to enjoy a coffee blend or any other exotic drink like tea or beer. And with its signature style, you’ll be announcing your support for T’Challa – the current King of Wakanda. 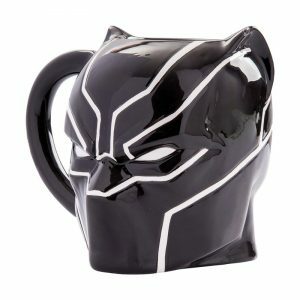 This Black Panther Mug is ceramic molded, it’s shaped in the design of the Black Panther’s mask in 3D, and it holds about 20 ounces. If you’re a Black Panther loyalist, we’re sure it’s the best way to enjoy a cup of coffee! If you’re in to superheros, a fun way to show it off at your home or office. Check out all of our top-selling superhero stuff to show off that you’re a serious fan!